Just inland from Guardamar del Segura and close to Cuidad Quesada the traditional Spanish farming village of Rojales sits on the banks of the Segura river which has played an important part in daily life here in Rojales. 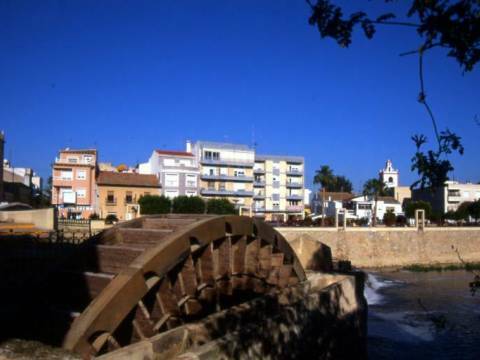 Rojales has a complex ancient irrigation system and the Azud dam raises the level of the River Segura to guide the water to the irrigation ditches and the Water Wheel which is guarded from the floods of the River Segura by massive stonework. Near to the fabulous weekly market, the Carlos III Bridge over the River Segura remains a key feature of the town. The subterranean Gasparito Wells store rainwater to supply the surrounding villages of Rojales. Rojales has a fantastic water park, with kamikaze slides and water slides and rapids for all ages of children. The Rojales Hills are popular with house hunters as they offer spectacular views over the valley, of the two famous salt lakes at Torreveija and La Mata, now designated Nature Parks and the surrounding towns and villages. The La Marquesa Golf Course is only a few minutes drive, with the golf courses at Las Ramblas Golf, Vistabella Golf, Campoamor Golf and Villamartin Golf being just a short drive away. The properties on Rojales Hills and Rojales itself are sympathetically built to complement the surroundings and include quaint bungalows, detached or semi detached villas, town houses, quads and apartments. Many of the properties in Rojales, as with most developments in the area, are built with lovely solariums and roof terraces from which you can enjoy the spectacular views of this fabulous area. See below to view a selection of our bargain properties in Rojales.